D-Link, the industry pioneer in wireless networking, introduces another performance breakthrough in wireless connectivity - the D-Link PersonalAir series of Bluetooth enabled networking products capable of data transfer among devices such as PDAs, printers, cellular phones, computers, and other emerging electronic devices. The D-Link PersonalAir DBT-120 USB Bluetooth Adapter is a very compact, lowprofile USB Bluetooth solution based on the Bluetooth 1.1 specification, making it compatible with other Bluetooth enabled devices. The DBT-120 was designed and engineered from the ground up to be compact and portable, making it the perfect solution for notebook computers, but also just as easy to use with a desktop computer. The DBT-120 features standard 128-bit encryption that provides you with a higher level of security for your data and communication. The D-Link PersonalAir DBT-120 includes Bluetooth management and connectivity software by WidComm, which enables you to configure and access Bluetooth enabled devices quickly and easily. The Bluetooth software enables your computer to discover and access available Bluetooth services ranging from Internet access to wireless synchronization with your PDA or cellular phone. 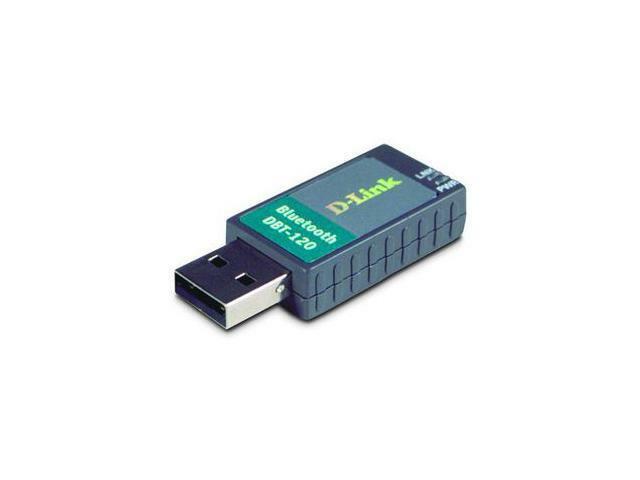 Compatible with USB 1.1, the DBT-120 supports Windows XP/2000/Me/98SE and Macintosh OS X 10.2 and installs quickly and easily to a desktop or notebook computer with an available USB port. 1.8" x 0.7" x 0.4"
Cons: DOES NOT work with Win7. It lists the OS it work with, no mention of Win7. That was not an oversight. Cons: When you buy this dongle it comes with an installation CD. The software it installs is called Toshiba Bluetooth Stack. It's only a 30 trial period, and NO OTHER software recognizes the device. After spending 2 hours on D-link's tech-support line, they told me to send it back for a replacement with a device that won't have the 30 day trial period. Toshiba, by the way, doesn't accept responsibility and refers you to D-Link. Other Thoughts: DON'T buy this. I made the mistake of going cheap, and it bit me. Pros: Works transparently under both Windows 7 and OS X. Has had no hiccups of any kind so far. Seems happy being connected through a hub. Cons: Price is higher than other units. Other Thoughts: This is the only unit that Apple recommends to add Bluetooth to Mac Pros that don't have it. Naturally enough, it's also the best choice if you're building a hackintosh. Pros: small, functioning, once i installed the drivers it came with.. the program it comes with is relatively simple, though the "device settings" is a little bit vague and sort of all- encompassing. Running fine on Windows 7. Cons: when the computer is sleeping/hibernating mash on all the buttons you want on your bluetooth keyboard or mouse, it aint gunna work. I'm not sure if thats a feature of bluetooth or just now this reciever works but its kind of annoying having to get up and walk across the room to startup. Other Thoughts: the usb extension cord is cheap but what do you need it for anyway? Pros: It worked until the trial software expired. Cons: The driver for XP came bundled into a "Bluetooth Stack for Windows by Toshiba" and it expired after 30 days. I then downloaded the drivers from DLink direct and it wanted an "activation key". Other Thoughts: I don't know about other OS, but if you are going to use this on Windows XP, then buy something else. Pros: Had to download the drivers from D-link for it to work right. Works great on windows 7 x64. Other Thoughts: The included usb extension cable is really low quality. to be the only one that worked on my PowerMac G5. Pros: Works well in Linux and Vista (with drivers from CD). The USB extension cable is cool. Cons: The green LEDs are really bright.